The semester is over, and next semester will be a fresh start. But before everything starts up again, take the time to reflect on last semester. If everything (or even anything) went well, make sure to celebrate - after all, celebrating your successes is a surefire way to make it happen again. Remember, you're not alone. College is much harder than high school, and it takes a while to adjust. Watch this video about bouncing back from academic struggle. Talk to your mentor - they are here to help you! If you are afraid of their reaction, try saying "I had a hard semester. I want to tell you about it, but I don't want a lecture or judgment." This will help them know that you want their listening and support. Maybe by the end of the conversation, you will be able to problem solve together. What were your grades? Grades are the obvious way to evaluate how you did academically. If they were less than you hoped for, think about why. What lessons did you learn about doing college level work? What did you learn about expectations? What did you learn about your study habits and abilities? What can you do differently next time? What classes did you love the most? Why? How can you build on this? Are there new areas you now think you’d like to explore? What classes did you hate? Why? Are these areas you’ll be able to steer away from? Do you need to adjust your attitude or strengthen your background? Don’t just let this go. Think about why you disliked these classes and what you can do. What worked well this semester? Consider this question both in and out of the classroom. What did you really like/enjoy this semester? What didn’t go well? Why? How do you feel about your social life? Friends? Activities? Are they helping you be the person you want to be or getting in the way? Do you need to consider any changes? How involved were you on campus? How often did you leave campus on the weekends? Do you need to stay more? Get away more? Do you need to get involved more? Do you need to do less in order to focus more or spend more time studying/with family/taking care of yourself? Did you have a job? Are you balancing school and work? Were there any surprises this semester? Why did that surprise you? What can you do with that information? Were there any disappointments? Why? Can you do anything to prevent future disappointments? What have you discovered about yourself this semester? What’s different about you now than at the beginning of the term? What strengths do you have that you hadn’t realized? Can you build on those? What weaknesses have you discovered? Do they matter? Can you work on those? If you had to sum it up in one sentence, what is the biggest lesson that you’ve learned this semester? Now that you know that, what can you do with that information? 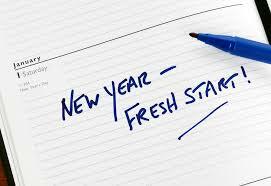 The New Year is all about resolutions, looking forward to the future, setting goals, and making plans. And when you build your goals and plans on the solid foundation of understanding the past, you'll be ready to keep moving forward.